Perhaps it’s down to my preoccupation with forests this week, but I decided it was time to revisit Giuseppe Penone’s Tree of 12 Metres at Tate Modern. The starting point of this sculpture – an industrially sawn timber beam – remains visible at the base of the pieces but Penone has carved it back meticulously and – by following the clues given by the knots in the wood – revealed the wood’s past as a tree. I love the combination of wood and tree here and the combination of industrial material and traditional technique that made the work. Clearly Tree of 12 Metres isn’t much of a forest, but the trees loom even if it would take more of them to qualify as even a bit of a wood. And though as trees they are dead, they have been given a new life of a different sort by Penone’s intervention. Somehow, though it talks about the uneasy relationship between nature and industry, there is a vibrancy about the work. With Penone’s help, though resurrection is impossible and there is a starkness to the sculpture, nature is nonetheless reasserting itself. The wood is reborn, albeit as art rather than tree. For the moment at least, no more forests. Although I do keep thinking about other possibilities and I am rather wishing I’d saved writing about Inez van Lamsweerde until now. Maybe I could have made a week of it. 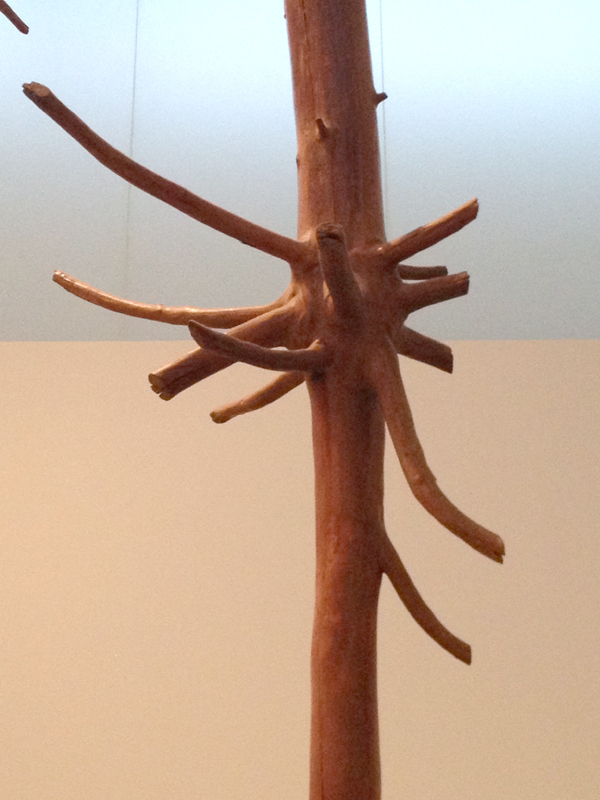 This entry was posted in Sculpture and tagged art, Giuseppe Penone, sculpture, Tate Modern, Tree of 12 Metres by Ann Jones. Bookmark the permalink.